Have you tried any of the ideas in my previous post? Let’s continue with more easy homemade treats for face. Avocado is simply wonderful to massage into your skin. Just get some on your fingertips and spread all over your face and neck in circular motion until it soaks in. If you only dabbed a tiny bit you won’t need to wash it off until you shower next. If you applied it more liberally and can see excess on your skin, then wash off with lukewarm water after 10-15 minutes. Oatmeal + honey + yougurt – mix one tablespoon of each and apply to your face massaging gently for a lovely exfoliating action. If you would like to add more zing, feel free to mix in a pinch of cinnamon for a polishing effect or a pinch of yeast for a stimulating action. Egg masks are amazingly easy and effective. 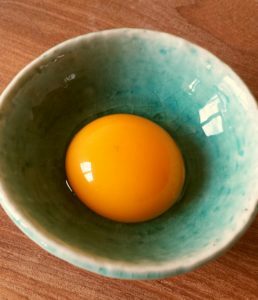 Just remember: only the yolk for dry skin, only the egg white for oily skin and both the yolk and the egg white for normal skin. You will only need about a tablespoon for your face and neck. Leave on while you are doing your yoga routine, then wash off with warm water and follow on with a few drops of your facial oil. Would you like something more tailored? Just let me know, I’d love to help! There are countless ingredients and combinations to pamper your skin. Use whatever you feel like. The key is to enjoy it. Until next time, have fun and stay beautiful! This entry was posted in beauty tips, we love. Bookmark the permalink.